In KPK, Baluchistan and Sindh the age of marriage for Christians are 18. However the age of marriage in Punjab for Christians is 16 years. Both the bride and groom should come with the copies of cnic of both for the registration of Christian court marriage in Pakistan. In case the bride and groom are below the age of 18 or don’t have valid CNIC they can bring their birth certificate or at least two passport size pictures. We will have their Christian court marriage done in just two hours. For court marriage for Christians the first thing need to be done is to contact a lawyer. If you are in Lahore our law firm in Lahore Pakistan can also provide you the services of Christian court marriage in Lahore Pakistan. Once you have hired a competent lawyer he or she will call you in the law office. A pastor will conduct the marriage of the Christian bride and groom. Once the marriage is solemnized as per Christianity religion the marriage documents will be registered in church and court premises. The lawyer will prepare a file and attach this marriage certificate with this file. Both the husband and wife will appear before the court and give statement that they both got married with their free with without any coercion or fear and no one have abducted or kidnapped the bride. The court will record the statement and issue the protection orders. Once the statement is recorded the lawyer will provide get you the attested copies of all the documents which will be a proof of Christian court marriage in Pakistan. These documents can be used anywhere in Pakistan and even abroad. Christian court marriage procedure is now made easy by the Christian marriage law. Christian marriage law has now facilitated a lot to the Christian couples. Court marriage procedure in Pakistan is required to be conducted by a competent law firm to avoid issues in future. At least two are required for the Christian court marriage procedure in Pakistan. If you can bring it then it’s good otherwise we can arrange that for you. Court marriage between Muslim and Christian is also allowed by the law provided that the groom is Muslim and bride is Christian. 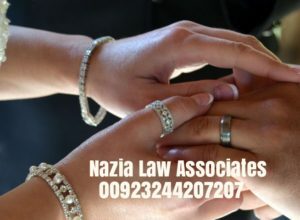 Contact Advocate Nazia for conducting the procedure of court marriage in Pakistan for the Christians. We are a leading law firm in conducting court marriage in Lahore Pakistan for all religions and sects. Our services of court marriage in Lahore Pakistan are the best all over in Pakistan. Our best lawyers make the court marriage procedure in Pakistan easy for all the religions and sects.